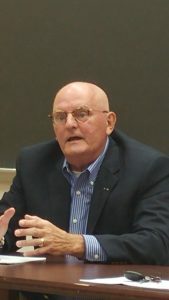 National Security in the Age of Trump was the title of the panel discussion on October 15 sponsored by Indivisible: Ohio District 12. 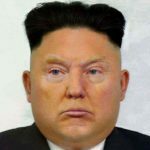 By the end of the evening, attendees were provided useful portraits of North Korean dictator Kim Jong-un and America’s wannabe authoritarian, Donald Trump. “On the one hand, you have an undisciplined, sociopathic, inexperienced fat guy with a bad haircut and nukes. And on the other side, you have Kim Jong-un,” said Dennis Laich, a retired U.S. Army Major General and currently director of the PATRIOTS Program at Ohio Dominican University. General Laich’s concerns about the plethora of unappealing qualities manifested by Dear Leader (um, in this case, that’s a reference to our guy) were echoed by Professor Mitchell Lerner, director of the Institute for Korea Studies at Ohio State University and the other panelist at the Indivisible Ohio gathering. 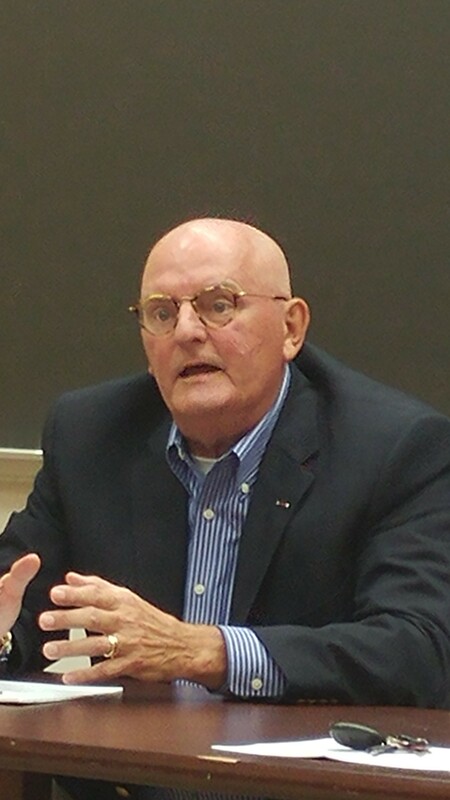 Jason Keiber, a visiting professor at Otterbein, served as the moderator for the evening’s discussion. Currently, the “air of tension makes war more likely,” Lerner said. 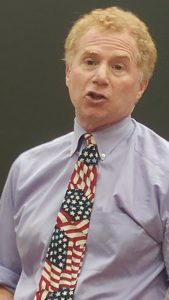 He pointed out that the most recent war scare on the Korean Peninsula came in 1994, during the Clinton administration. What has made the situation more difficult today, Lerner explained, is that there are more than 14,000 artillery pieces aimed to the south of the Demilitarized Zone, augmented by more than 5,000 tons of chemical and biological weapons held by the Democratic People’s Republic of Korea, as the last surviving Stalinist nation officially calls itself. Add to all this is the fact that Korea’s capital, Seoul, a bustling city of more than ten million people and the second largest metro area in the world, is located only 35 miles from the DMZ. In this very charged situation, Trump enters the current crisis over nuclear weapons development as the proverbial bull in the china shop. “The president clearly doesn’t seem to understand the impact that his words have,” Lerner observed. “There are cool-headed individuals involved in the foreign policy-making apparatus” on both sides, and that’s clearly needed. But what worries Lerner is that wars usually don’t start on a planned basis. Miscalculation or domestic politics are two of the dynamics at play in the present crisis. In spite of the cooler heads, the professionals working in the background on both sides, we are in a dangerous game with Trump and his threatening tweets. That air of tension makes war more likely, precisely because of the possibility of miscalculation made more likely by the present, overheated state of affairs. Lerner related that during a recent visit to South Korea, he met people who were actually questioning whether the United States would live up to its treaty commitments in defending its important ally. It is Trump’s rhetoric and bellicose manner that have caused our traditional friends to be anxious about the loss of focus on diplomacy that has been replaced by a torrent of threatening words. General Laich has seen the same troubling turn of events. “We are in the process of alienating a number of our historic allies around the world,” he told the audience, and the current situation is fraught with danger. Laich was careful to add that both China and Russia, like South Korea, are neighbors of North Korea and also have geographic, economic, and strategic interests in the current state of affairs within the Korean Peninsula. Where could all of this lead? How many Koreans and Americans stationed in South Korea would die within the first 96 hours of war? Laich asked rhetorically. How long would such a war last? At what cost? Who would serve? “These are questions that the American people ought to be asking the leaders who are in the process of marching us toward a war on the Korean peninsula,” Laich pointedly observed. In this case, the plural word leaders also means the United States Congress, which by its silence during the growing crisis has abdicated its constitutional authority under Article 1, Section 8. The American people have yet to hear any level of cautionary words from Paul Ryan, Mitch McConnell and others in the congressional leadership who have raised the same questions posed by General Laich and by Dr. Lerner. • There currently is no United States Ambassador in South Korea. As of last week, only 145 of 602 key positions requiring Senate confirmation, including ambassadors, have been confirmed and filled by the Trump Administration. • The position of Assistant Secretary of State for East Asian and Pacific Affairs is also vacant. • Funding cuts approaching 40 percent have been recommended for the State Department and the Agency for International Development, a key force for projecting American “soft power” in the world, as opposed to military strength. The product of all of Trump’s saber rattling is the effect he is having on his own party. A recent Quinnipiac University national poll indicates that as of now, “46 percent of Republicans – a plurality – said they would support a preemptive strike against North Korea.” The story about this poll contains this ominous subhead: “Is it the Trump Effect”? Of all the scary facts and figures that were shared with the audience at Otterbein University, this finding from a respected poll should be taken as a wake-up call to signal the need for a congressional intervention. Since Trump is incapable of controlling his own rhetoric and thus serving as the worrisome miscalculation factor that Professor Lerner alluded to in his remarks, the very fact that a plurality of the president’s own party want to strike North Korea without notice demonstrates the dereliction of duty present today and the abrogation of congressional responsibility under Article I, Section 8. In addition, a previous Quinnipiac Poll released on October 12 had these findings:. American voters say 57 – 40 percent that they do not have confidence in Trump to handle the situation with North Korea. But voters say 65 – 28 percent they do have confidence in “top national security and diplomatic officials” to handle the situation with North Korea. The U.S. will be able to resolve the North Korean situation diplomatically, 54 percent of voters say, while 29 percent say it will need to use military force. So with all of these forces signaling continuing trouble ahead, what is the advice of the experts? It’s rather simple. Tone down the rhetoric – now. “Kim believes in assassination but not in suicide,” says General Laich. Thoughts of suicide do tend to influence dictators to consider becoming a “rational actor” on the world stage. • Rebuild and strengthen our regional alliances that have been damaged by the rhetoric that has helped to fuel this crisis. • Rely on diplomacy and statecraft to build a level of communication that will serve to dispel some of the present toxic atmosphere. That process can start once the State Department itself comes out of its current malaise and capable, qualified public servants are in a position to realize some positive results through dialogue and engagement with all of the players with stakes in the Korean Peninsula. • Through diplomacy and lowered voices, create the climate that will allow for slow yet inevitable change in North Korean society. Yes, all of this requires patience, hard work, and the lowering of bellicose voices. The other choice is to continue the path to war that will lead to the loss of life of millions of people and untold economic and environmental harm. Unfortunately, that unacceptable option was raised a few days ago by the ominous words of another general, H.R. McMaster, Trump’s National Security Advisor, in remarks at the Foundation for Defense and Democracy. “There are those who have said, ‘What about accept and deter?’ Well, accept and deter is unacceptable,” McMaster told his audience. Given McMaster’s words and Trump’s manic tweets, it will certainly prove to be difficult for the large percentage of Republicans who want war and a preemptive strike to accept such recommendations for patience and by doing so also accept the present nuclear status-quo. In fact, many will be ready to make the charge that deescalating the rhetoric, rebuilding our alliances, and working at diplomacy may be a modern-day exercise of appeasement. But a British statesman who criticized his predecessor for conducting a policy of appeasement in the 1930s toward Hitler might provide us with the best advice. Speaking in 1954, eleven years before his death and just nine years after the defeat of the Nazis, Winston Churchill offered some wisdom for the ages. “Meeting jaw to jaw is better than war,” he advised. In our modern world, where the internet was unimagined during Churchill’s lifetime, it might be said that it is better to think through than to tweet tweet. No one can shout and at the same time tell the truth, one of my professors observed years ago in a graduate school historiography class. Yet before any scholar considers writing about the tenor of these times, it’s past time for Trump, McMaster, and other members of the administration to lower their voices and apply some learning from history. “Domestic policy can only defeat us; foreign policy can kill us,” John F. Kennedy warned in 1961, a year before he faced his own crisis over missiles and nuclear weapons in Cuba. Certainly General Laich and Professor Lerner, indeed their entire audience at Otterbein University, would agree.